Jose Bautista prepares in the on-deck circle against the Pittsburgh Pirates. The Phillies appear set to add another bat to their bench just before the calendar turns to September and the real playoff push begins. 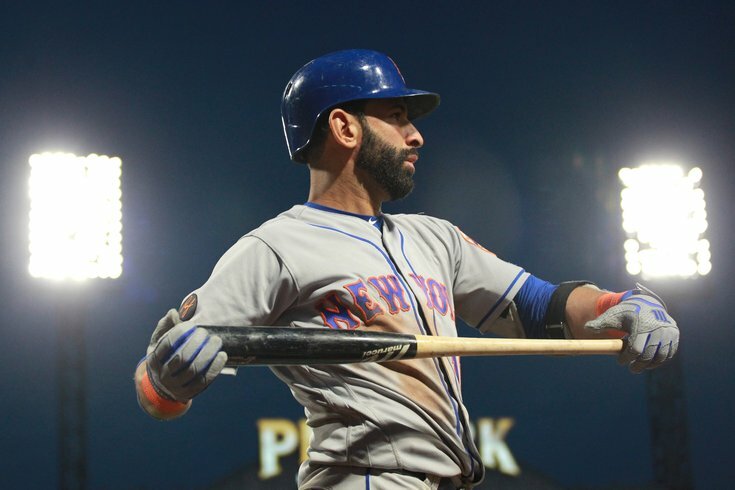 According to Ken Rosenthal of The Athletic, Philadelphia has claimed former Blue Jays slugger Jose Bautista off waivers from the Mets. UPDATE: As first reported by Joel Sherman — and since confirmed by the team — the Phillies and Mets have completed a deal for Bautista. Bautista, who is in his 15th season and made six straight All Star appearances from 2010-2015 while hitting 227 home runs in that span, is batting just .199 with 11 home runs this season with a pair of NL East rivals, the Mets and Braves. Because this is revocable waivers season, the Mets can pull Bautista back if the teams are unable to complete a trade within the allotted amount of time. As Rosenthal stated in his tweet, that clock expires tomorrow. But it's looking like a deal will get done.